Mix and Chic: Unexpected touches in decor! Nothing make quite an impact or a design statement as an unexpected piece or element in a room. Below are a few examples of such interiors. An unexpected ceiling mount light fixture with an adjustable arm truly makes a design statement in this industrial style dining area. An oversized ornate mirror leaned on the wall creates a major visual interest in this charming and feminine bedroom. The addition of a large three panel mirrored foldable screen that also serves as an unconventional headboard becomes the focal point in this neutral room. A hand drawn illustration applied in the empty space above the book shelves creates an instant drama in this gorgeous and eclectic home office. Do you use unexpected elements in your home decor? Which one of the above is your favorite room? Hi Jesse, so lovely and unique! Have a great weekend..
That is how I like to decorate! Start traditional, layer with some modern pieces and then at the end bring some unexpected touches (and humor) to the room. And one day, one day - I would like a brick wall in my dream kitchen! LOVE that first image. that last sunroom is gaga. the wall art, the purple floor...i would be in that room every minute! Hi Jessie! Hope you're having a good Saturday. I really like that last picture. It looks like the illustration extends to the other walls, too. Awesome! These are great examples of unexpected elements that make a dramatic design statement. I love over sized mirrors when strategically placed, and unique lighting always adds a powerful, visual impact. I absolutely LOVE that mirror! 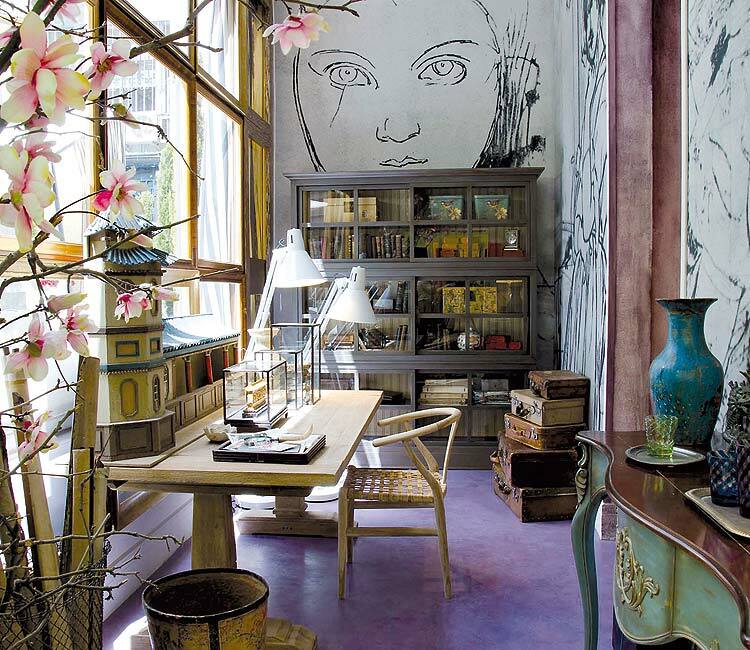 I love that office/room with the huge illustration behind the hutch and that delicious purple floor...very unexpected. I love that even those the feature pieces stand out they dont overtake the room and work cohesively with the rest. Fab post Jessie. Love all of these eclectic dramatic touches Jessie - you are right they sure make an impact. Oh Jessie, so creative and fun. Love rooms that are different. Love that first chandelier. I agree, Jessie. That first space is amazing - so stylish! I LOVE this post, I love spaces that are creatively imagined, there is so much personality in each of these. I love all 4 of these and couldn't possibly pick a favourite! Fab fab fab! 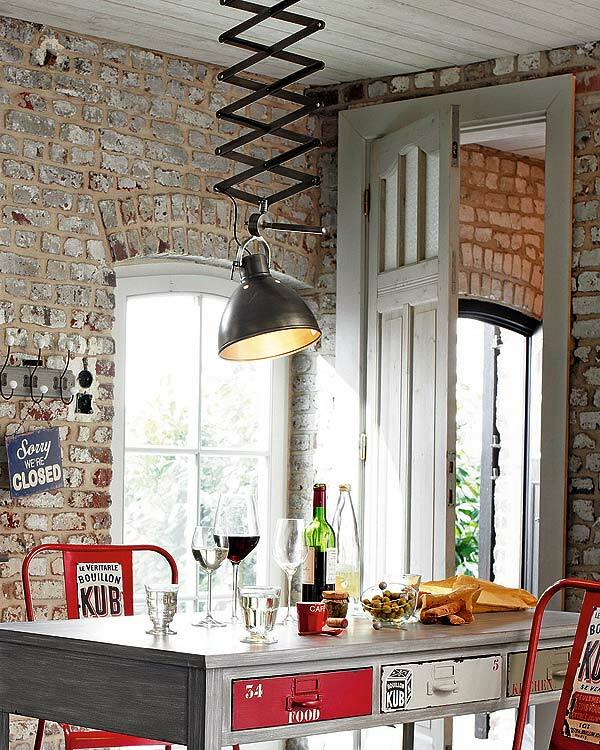 Love the first one, that mix of industrial and rustic style. I like the unexpected when it works. I do have a large mirror propped up on the floor in my family room - it was unintentional but it works and opens up the space. I do also like the headboard idea here.